Is Ryan Kelly’s iconic photograph an American ‘Guernica’? 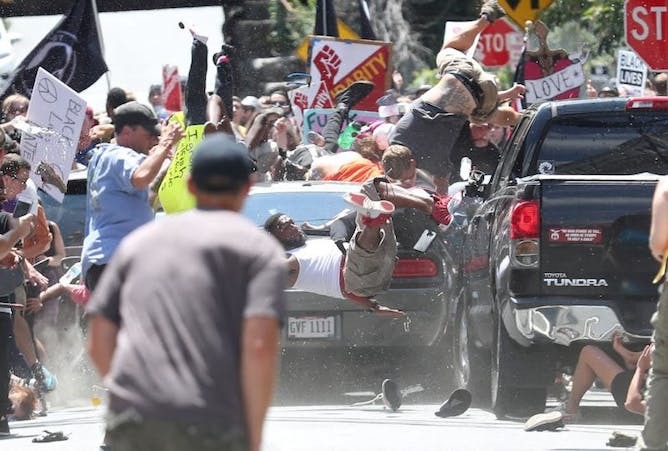 On August 12, Charlottesville Daily Progress photographer Ryan M. Kelly captured the exact moment that Nazi sympathizer James Alex Fields, Jr. drove his Dodge Challenger into a crowd of counterprotesters, injuring 19 and killing 32-year-old Heather Heyer. It’s probably the most enduring image to emerge from the weekend of “Unite the Right” rallies in Charlottesville, Virginia. At first glance, Kelly’s photograph is nearly impossible to make sense of visually or politically. Cars are not supposed to drive into pedestrians; fellow citizens are not supposed to kill each other over political differences. And there’s so much in the frame of the image – so many figures and forms crowded together, most only partially visible – that you can’t take it in all at once. Jennifer Wenzel, Associate Professor of English and Comparative Literature and Middle Eastern, South Asian, and African Studies, Columbia University.